Sure you’ve heard of a ‘dosado’, but how much do you really know about square dancing? With its roots in Morris Dance, English Country Dance and the quadrille, square dancing developed in America and then spread internationally. There are two kinds of square dancing today: traditional square dance and Modern Western square dance, the latter having a larger following. Square dancing clubs can be found almost anywhere and the dance itself continues to change and develop. 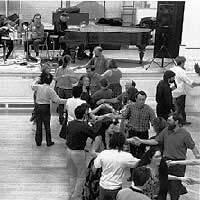 Traditional square dancing is usually done alongside contra dances (dances where a string of couples face each other, forming two long lines). It is found mostly in eastern regions of the United States such as New England, Appalachia, and the South. It’s set to traditional country music, such as reels and jigs. A traditional square dance is essentially the quadrille, which originated in 18th century France and then became popular in upper class English society. Like all square dances, the traditional style consists of four couples, with couples one and three acting as the head couples and two and four acting as the side couples. This is called having your ‘sets-in-order’. During the early days of the dance in North East America, there was often an outgoing member of the group who remembered the steps to the dances best and called them out for all the others. This was the birth of the ‘caller’, an integral role which is still featured in square dance clubs today. Western square dance, or Modern American square dance, took shape around the 1930s. As part of his New England restoration project, Henry Ford became interested in reviving the popularity of square dance. He called upon experts to modernise and re-teach the dances. Around the same time, a school teacher named Lloyd Shaw began to notice that many of the folk dance teachers and callers across America were aging and dying off with no one to replace them. He decided to travel the country and compile the instructions for traditional square dances, writing articles and books and conducting classes for new teachers and callers. As a result of Ford and Shaw’s work, Western square dancing as we know it was born. The music used for modern square dances can be anything from pop music and contemporary country to rock and techno. In general, though, Western square dance is faster than traditional square dance. Modern Western square dance is often alternated in an evening with round dances, or ballroom-type dances for couples. Square dance callers are a crucial part of the square dance community. They not only remind dancers of the steps to a dance, but are responsible for making an evening lively and fun! An organisation called Callerlab has been responsible since the 1970s for organising and standardising calling practices in Western square dance. Although there are usually between forty and fifty calls in a traditional square dance, calling is even more complicated in Western square dances since almost no two dances are alike and choreography is constantly changing. All over the world, square dance is celebrated as a fun community-based dance. In fact, its unifying power makes it a popular activity among groups seeking both like-society and a good time. There are even international associations for some such groups, such as youth square dancers and gay square dancers and callers. New ideas and trends constantly sweep the square dance community, making certain movement variations or styles of dress more popular in one place or another. As a result of its changeable nature, square dancing maintains a good deal of vitality and excitement. This ensures that members of square dance clubs across the globe are always learning and always having fun!